Have you ever been to a major league baseball game? Well, ’tis the season, and I’d love to go to another, especially like the one where this picture was taken. 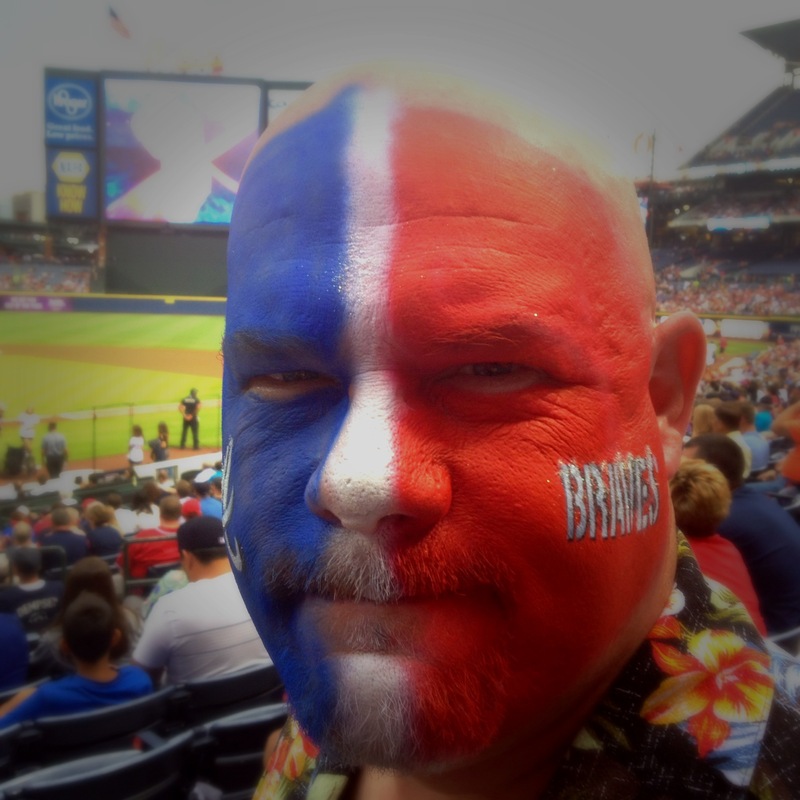 It was on a night when the Braves (my favorite team) beat the San Diego Padres 6-5. Oh yeah! It was a great game, too! The Braves were behind five runs for the longest, but then they got their act together and pulled out a win in two innings. All the while my family and I were cheering, doing the “tomahawk chop,” and enjoying the weather (it didn’t rain on us). That was my daughter Haley’s first-ever baseball game, too, so it was extra-special for me to be proven correct when I offered her some encouraging words. When the Braves were still down by 5 runs, she was a little discouraged and thought it was sad that her first game would be a loss. However, I reminded it her that the game was not over – and I had my game face on. Whatever you are going through right now, remember that victory only comes to those who stay in the game. Just because it may seem like you’re behind in the score, don’t give up! Many years ago I competed in a martial arts tournament. In the championship match of my belt and weight division, I had to fight against a guy that was, quite honestly, better than me. I wasn’t too nervous or scared, but I knew I had my work cut out for me. Long story short, my opponent hit me in the right side of my head with a spinning heel kick. Needless to say, I went down – and almost out. Because this was tournament point fighting (like the kind Chuck Norris did), and that kind of kick was considered excessive contact, I was given two minutes to recover, or else I would lose the match. With the tune of “Eye of the Tiger” and the theme from Rocky playing in my head, and my dad giving me a look that said, “You da man, bro!”, I managed to stand, gather my senses and get back in the fight. The only difference was that this time I was mad – I had my game face on! I’m happy to say that I came back and won that fight and got a big 1st-place trophy to show for it. But more than a trophy, I got the satisfaction of knowing that I could come back from nearly being knocked out (everything went blue) and win. If you don’t get it by now, maybe you never will… Life is all about struggle, but no race, no game, and no fight is ever won by quitting before it’s over. Set your eyes on the prize; press forward toward the goal; dust yourself off and get back in the fight. If you are on the side of Christ, you’re already on the winning side. Put your game face on! Have you ever been to a major league baseball game? I have. As a matter of fact I went to one this past Tuesday night and watched my favorite team, the Atlanta Braves, beat the San Diego Padres 6-5. Oh yeah! It was a great game, too. The Braves were behind five runs for the longest, but then they got their act together and pulled out a win in two innings. All the while my family and I were cheering, doing the “tomahawk chop,” and enjoying the weather (it didn’t rain on us). This was my daughter Haley’s first ever baseball game, so it was extra-special for me to be proven correct when I offered her some encouraging words. When the Braves were still down by 5 runs, she was a little discouraged and thought it was sad that her first game would be a loss. However, I reminded it her that the game was not over – and I had my game face on. Long story short, my opponent hit me in the right side of my head with a spinning heel kick. Needless to say, I went down – and almost out. Because this was tournament point fighting, and that kind of kick was considered excessive contact, I was given two minutes to recover, or else I would lose the match. With the tune of “Eye of the Tiger” and the theme from Rocky playing in my head, and my dad giving me a look that said, “You da man, bro!”, I managed to stand, gather my senses and get back in the fight. The only difference was that this time I was mad – I had my game face on. If you don’t get it by now, maybe you never will. Life is all about struggle, but no race, no game, and no fight is ever won by quitting before it’s over. Set your eyes on the prize; press forward toward the goal; dust yourself off and get back in the fight.